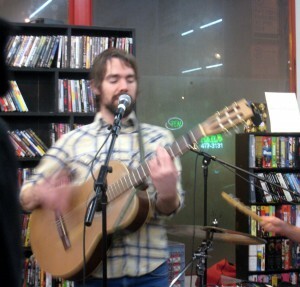 They played a short set of songs from both of their albums, opening with “The Ticonderoga” and closing with “Chimes”. While I’ve seen their style described as freak folk, I’m not really sure where that label comes from, as their music was closer to folk rock than anything else. (Maybe I just have a misunderstanding of what comprises the freak folk genre. Or maybe that genre is becoming just as much of a catch-all as “indie” is.) Their playing was very tight, and vocals and instrumentals sounded fabulous, even in a record store which was very clearly not designed for hosting musical acts. Phil Moore’s vocals were great, and the four part harmonies that crept in every so often were gorgeous. Beth Tacular’s voice got lost a bit in the room, but from what I did hear, she has a very pretty, delicate voice — perfect for the type of music the band plays. The show was a great opportunity to see an up-and-coming band in an intimate setting with a handful of other fans. Hopefully, they’ll swing by Chicago again sometime when I’ll be able to see a full set, in a venue that does their sound justice.